C Reviews – Escape Reality, Read Fiction! 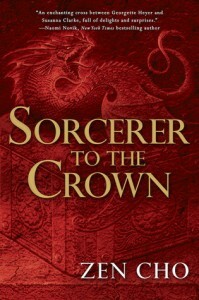 Sorcerer to the Crown was one of my favorite books of 2015. From the joint review Lou and I did at The Book Pushers in 2015, it’s pretty obvious that it was one of her favorites too. The hoped for sequel has been on my most anticipated list ever since. That long awaited sequel has finally arrived in the manifestation of The True Queen. I wanted to love this book. I expected to love this book. And I’m SO disappointed that I didn’t. It’s not a bad book. It certainly has some interesting moments. But, and in this case it’s a very large but, it just doesn’t have the same verve as the first. Sorcerer to the Crown was epically readable, because there’s just so much going on from the very first page. Definitely on the other hand, The True Queen just doesn’t have that compulsive readability. Instead, the first half of the book plods. It’s slow. Not much seems to happen. Part of that is that we need to be re-introduced to this world and its characters. 2015 was a long time ago, even if not much time has passed within the series. 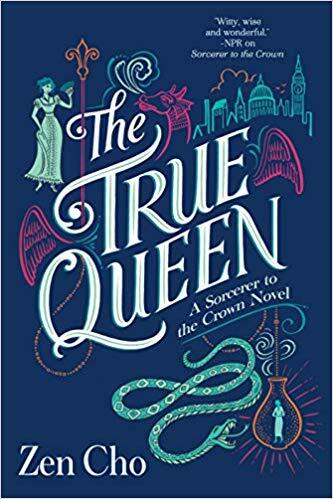 But a lot of it is that the protagonists of The True Queen are passive, where the protagonists of Sorcerer to the Crown were both very active participants in the story. Instead, one of the main characters of The True Queen is fridged for a big chunk of the story. And while Sakti is frequently annoying, especially to her sister Muna, she is also the more active of the pair. Of the sisters, Sakti is proactive – even if usually wrongheaded – while Muna is reactive. Unfortunately, it’s Muna the passive that we end up following for the first half of the story. And while Sakti always overestimates her capabilities, Muna underestimates hers. As a consequence, Sakti is the one who makes things happen – even if they are often the wrong thing. Muna usually cleans up after Sakti. Without Sakti around to push her, she spends a lot of time waiting for something to happen, for someone to help her, or for the situation to become clear. The two very active protagonists of Sorcerer to the Queen are relegated to background roles, and the story misses their drive immensely. Instead, the true standout character in The True Queen is Prunella’s shy and retiring friend Henrietta. About halfway through the book, once all of the situations are set, the action finally kicks into gear. That’s the point where Henrietta finally takes her courage into her hands, and Muna sets plans in motion to rescue her sister instead of waiting for someone else to tell her what do it and how to do it. From the point where the action moves to the court of the capricious Queen of Fairy, the situation becomes both more interesting and more dangerous. Not just because Henrietta manages to find out what she’s really made of, but because Muna takes the lead and figures out who she really is and what she’s been meant to be all along. Escape Rating C+: This is a book that does reward sticking with it, but it takes a lot of stick. The action does not really get going until the book is half over, and that’s a lot of set up. In the end, it makes sense that Muna is as passive and reactive as she is – but it still makes The True Queen a disappointment in comparison with its predecessor. And I’m so, so sorry about that. Quoth the Raven, “Nevermore” and that’s pretty much how I feel about this book. Quote me as disappointed. I expected so much from this book after the awesome Imperial Radch series – but I did not get it. And damn but I’m sad about that. The story is, for the most part, a familiar one. The heir to the kingdom returns from service at a contested border. He’s received a message that his father the king is dying, and he needs to be back in the capitol to see him one last time and for the handover of power. But when he enters the capitol he discovers that nothing is as its supposed to be. His father is missing and his uncle has taken the throne, seemingly peacefully and with the full agreement of the other power brokers in the kingdom. In spite of the kingdom being more of a theocracy than a kingdom, where the ruler is not called king but is the voice of the local godling for as long as he lives, the story is one that has been done before. This is where it should get interesting, because we see the story not from the perspective of either the “king” or the “prince” or even the “prince’s” aide, but from the perspective of a local godling who has seen it all. In fact, the story is being told by the godling, both to the reader in its first-person perspective, and to the aide in the second person. So the godling tells big parts of the story as “I” and other parts as “you”. 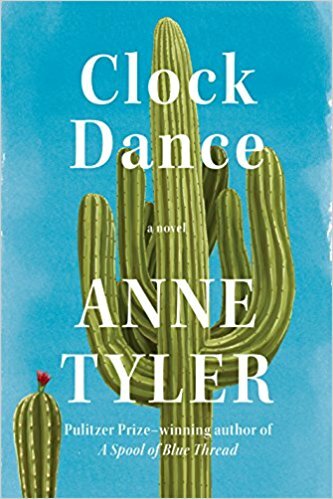 One of the things this author is known for is her inventive uses of voice, but this particular variation, while technically interesting, and more than a bit meta, is distancing for the reader, who is not, after all, the aide. The godling’s first person narrative actually works better than the second-person narrative – at least we know what the godling is thinking and where it’s coming from – even if it is just a big rock and doesn’t move. But, and it is a very big but, the godling’s perspective begins at the beginning of time in this world and comes to the present day in its own good time. After all, as a big rock, that has sentience but has chosen not to have mobility – it has nothing but time and takes the long view of everything. The feeling I got as a reader was as if James Michener decided to write fantasy, as many of his longer books (Centennial, Alaska, etc. ), start with the rocks, and move through the geologic and prehistoric ages much as The Raven Tower does. I loved his books, but I was always grateful when the first animals would appear because it finally gave me a perspective I could almost identify with. Not to mention the plot usually started to move at that point – along with the animals. I should be saying “I digress” at this point, but it doesn’t feel like I did. Make of that what you will. Escape Rating C: I wanted to like this so much, and I just didn’t. The experiment with voice was interesting but distancing rather than compelling as it was in Ancillary Justice. The injection of the godling’s perspective allowed for a fascinating bit of deus ex machina at the end, involving a quite literal deus, but it takes a LONG time to get there and not nearly enough happens along the way. There was so much that could have been done here. A lot is said about the way that words have power, and it’s interesting and different but also adds to the distancing. The godling has learned that its words have the power of truth in that if it says something that is not true its power will be sacrificed to make it true. If it says a large or impossible truth, that sacrifice may consume all of its power. As a consequence, much of its own story is told with the preface, “Here is a story that I have heard.” so that it never runs the risk of claiming that something is true that is not. While this is logically consistent from its perspective within the context of the story, it does add a layer of remove to the storytelling. In the end, interesting but neither compelling nor absorbing. I will say that the reviews vary widely. Those that love it really, really love it. Those that don’t really, really don’t and there’s not much middle ground. If you like experimental fiction or metafiction in your fantasy, give it a try and see what you think. Jeffe Kennedy seems to be participating in one of these fantasy romance anthologies every year, because that’s where I get them from. There’s always a story from her awesome Twelve Kingdoms series, and I’d get the whole thing for that alone. But the other stories are frequently awesome, occasionally even awesomer, so I’m glad to collect the set! 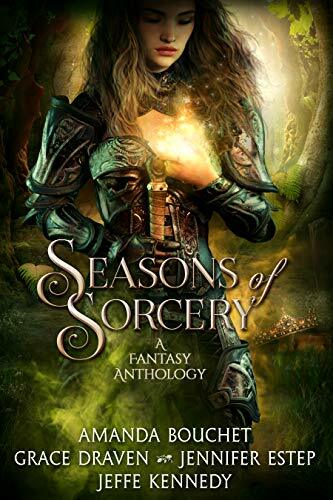 Seasons of Sorcery contains four fantasy romance novellas, all but one set in its author’s ongoing series. Winter’s Web by Jennifer Estep is set in her Elemental Assassin series, which I haven’t read – or at least not yet. The story takes place at a Renaissance Faire in an urban fantasy-type world where magic exists but seems to be mostly, but not totally, hidden in plain sight. As I said, I haven’t read this series, but I still enjoyed the story. The Ren Faire setting always provides an interesting backdrop for urban fantasy, and this story is no exception. 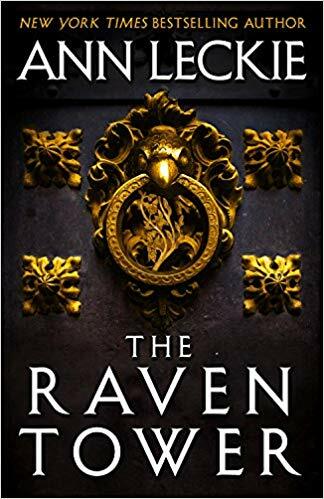 I suspect that the story didn’t have quite the resonance for me as it would for readers who are familiar with the series, but it still worked well and I didn’t feel lost at all. I liked it more than enough to put this series on the towering TBR pile! Although A Wilderness of Glass by Grace Draven is set in her Wraith Kings world, which I have not read, the setting felt awfully familiar. Only because it was. 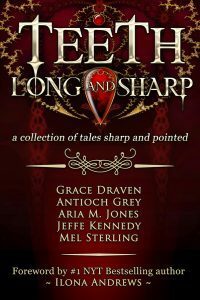 This story is set in the same town and among the same people as Night Tide, her fantastic story in Teeth Long and Sharp. A story that I loved. I didn’t find this story to be quite as good as Night Tide, possibly because it was a bit too reminiscent of The Shape of Water. Albeit with a slightly different version of the happy ending. At least as far as we know. There’s nearly always one story in a collection that doesn’t work for me. It’s the nature of collections that you get to sample authors you may not be familiar with, but might like because they are like someone you already do. Not that any fantasy romance reader is not familiar with Amanda Bouchet and her terrific Kingmaker Chronicles! But A Curse for Spring by Amanda Bouchet is the story in this collection that just didn’t work for me. Which is ironic because it is the one story that is not in a previously created world of any kind. For this reader, the problem with this story was that it felt too obvious. It seemed clear from the very beginning what was going on, who was responsible, and how the problem was going to get solved. I kept wanting the story to either just get on with it or go someplace interesting – but it did neither. Last but definitely not least, The Dragons of Summer by Jeffe Kennedy. This is the story that I got this collection for, and it did not disappoint – although it did occasionally infuriate – but in a good way. This story is set in Kennedy’s Twelve Kingdoms/Uncharted Realms series. While it seems to take place directly after The Arrows of the Heart, much of the emotional heft of the story comes from its relationship to the heroine of her Chronicles of Dasnaria series. The long shadow cast by the lost Dasnarian princess Jenna still looms over her brothers Harlan and Kral. Neither of them know their sister’s fate, but both had a hand in setting her on her path. It’s not just her brothers that are ignorant of whether Jenna is alive or dead. 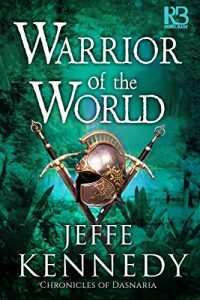 The final book in that series, Warrior of the World, is due out on January 8. I’ve never been so glad to have an ARC! It’s not so much that either the previous story, Exile of the Seas, or this short story end in a cliffhanger as that it is now obvious that Jenna’s fate is going to be the key that resolves EVERYTHING in both series. It’s just the kind of ginormous wrap-up that makes readers salivate waiting for the next book in the series. But it also means that this story, of all the stories in the collection, is the one that really only makes sense if you’ve followed the series. And if you love fantasy romance and you haven’t read the series, what on earth are you waiting for? Begin your journey with The Mark of the Tala, and settle in for a marvelous read. We are the first generation to live in a science fiction world. Media headlines declare this the age of automation. The TV talks about the coming revolution of the robot, tweets tell tales of jets that will ferry travelers to the edge of space, and social media reports that the first human to live for a thousand years has already been born. 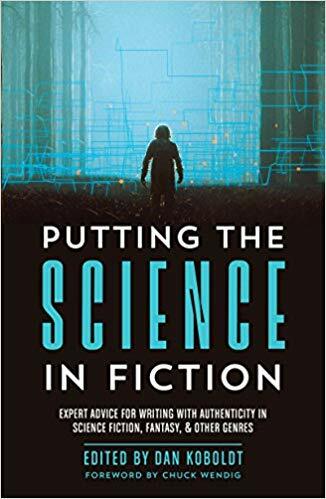 The science we do, the movies we watch, and the culture we consume is the stuff of fiction that became fact, the future imagined in our past–the future we now inhabit. Guardians of the Galaxy Is Space Full of Extraterrestrials? Jacking In: Will the Future Be Like Ready Player One? Mad Max Is Society Running down into Chaos? The Internet: Will Humans Tire of Mere Reality? Blade Runner 2049 When Will We Engineer Human Lookalikes? And many more! 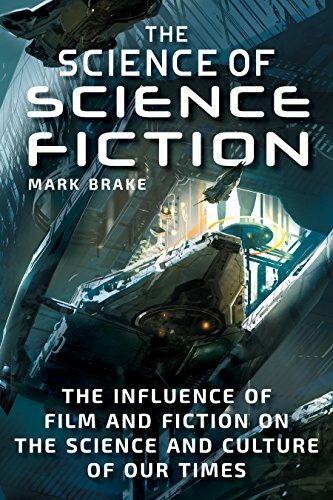 This book will open your eyes to the way science fiction helped us dream of things to come, forced us to explore the nature and limits of our own reality, and aided us in building the future we now inhabit. If Robert Asprin’s Myth-Adventures series had a love child with Piers Anthony’s Xanth series, and then if that love child had a child with Monty Python – or possibly a love child with each individual member of Monty Python, all midwifed by The Princess Bride, you might get something like Kill the Farm Boy. Or you’d get a cheese sandwich. Or possibly both. On the one hand, the description of this book can easily be read as a fairly typical epic fantasy. A group of adventurers, including a ”chosen one” set out from obscurity to undertake a quest. But this particular fantasy is fractured from beginning to end. Like so many fantasies, the adventuring party consists of a wizard or two, a rogue, a warrior, a bard and a trusty steed. The opening salvo in the quest is to rescue a fairy tale princess from a sleeping castle. In a twisted cross between Sleeping Beauty and Beauty and the Beast. That beast is a rabbit. Or at least sort of a rabbit. And sort of a girl. The rogue is a klutz, and a not very bright klutz at that. Of the two wizards, neither is exactly the leader of the Light. One fancies himself a budding Dark Lord, and the other is as grey as grey can get – except for her hair, because the natural color of that has been hiding behind magic for decades at the very least. The dangers they face are life threatening and never ending. But there’s no farm boy in sight. Oh, there was a farm boy all right, but he gets chosen for death relatively early in the story. The real “Chosen One” is the trusty steed, but he’s neither trusty nor exactly a steed. And he likes to eat boots. If the tongue was any further in the cheek, it would poke out the other side. 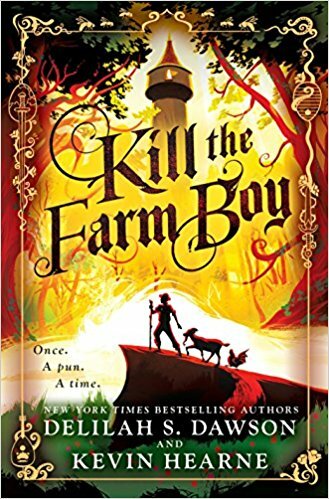 Escape Rating C+:Some of the reviewers make the comparison between Kill the Farm Boy and the Discworld. If that comparison holds at all, it’s only between Kill the Farm Boy and the first two Discworld titles, The Color of Magic and The Light Fantastic, where Sir Terry was merely skewering the genre and not exactly plotting a story. And where he clearly had no clue yet that he was at the beginning of something that needed a real plot, sympathetic characters and at least a bit of internal consistency to wrap around that skewer. 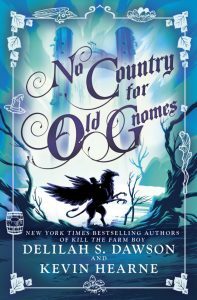 While I love the work of both of this book’s authors, Delilah Dawson for the Blud series and Kevin Hearne for the Iron Druid Chronicles, this collaboration does not live up to either of their previous work, nor to any of the many antecedents I mentioned at the beginning of this review. And that’s a real pity, because Kill the Farm Boy had so much promise. And it does have its funny moments. But in the end it doesn’t deliver – even though it’s obvious that the co-authors had tons of fun in the process of writing this. The snark is too thick and the plot is too thin. It reminds me of the lesson that Mike the computer learns in Robert A. Heinlein’s marvelous The Moon is a Harsh Mistress. Mike is trying to teach himself humor, and his human friend introduces him to the difference between “funny once” and “funny always”. Kill the Farm Boy attempts to be “funny always” by keeping up a nonstop torrent of snark and in-jokes. And those are almost always “funny once”. But we’ll be back in Pell for No Country for Old Gnomes. It took Sir Terry until at least Mort (Discworld #4) for that series to really get its legs under it. Maybe The Tales of Pell will manage to get there a little sooner. We’ll see. 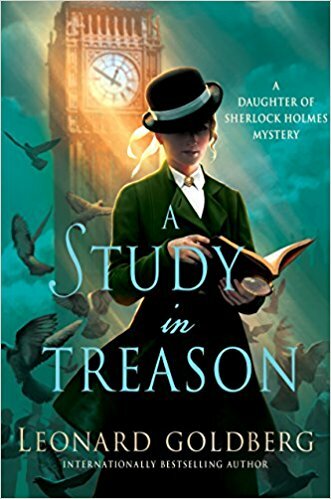 A continuation of USA TODAY bestselling author Leonard Goldberg's The Daughter of Sherlock Holmes, A Study in Treason is a new intriguing locked room mystery for Joanna and the Watsons to solve. A Study in Treason is the followup to last year’s The Daughter of Sherlock Holmes. I’m a sucker for Holmes’ pastiches, and I absolutely loved that first book. 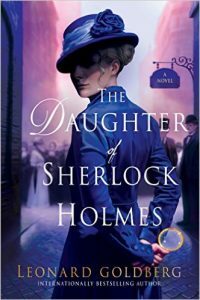 Not only was it the right book at the right time for me, but it seemed to hit all the right notes, with Holmes’ daughter taking her father’s place and solving crimes with Dr. Watson Sr. as well as his son, Dr. Watson Jr. In keeping with the spirit of the original stories, Watson Jr. is the chronicles of these new events. But after having read A Study in Treason, I’m starting to wonder if this is something that can only be done well once. Part of what makes the first book so much fun is the nostalgia factor; that it echoes the originals while being just a touch new and just slightly different. Nostalgia can only carry a person, a book, or a story so far. And I think that shows in this second book. While Watson Sr. is an older version of himself in the canon, very much as he should be, the new characters need to go in at least a few new directions. Instead, Joanna Blalock Watson feels more like a carbon copy of her famous father. It is ironic in a case that proves that nurture is more important than nature, that Joanna seems to have each and every one of Holmes’ talents and habits, in spite of not having been raised by him. While Joanna certainly knows who her father was, I’m not certain that she actually met the man. Yet somehow, not only his talents but his every habit seems to have passed down to her, as if by osmosis, barely changed from the original. And while the talents could indeed pass through the blood, that the habits would too seems a bit unlikely. The story in A Study in Treason, recalls The Adventure of the Bruce-Partington Plans, while its title calls back to the first published Holmes story, A Study in Scarlet. But in spite of the veritable school of red herrings thrown in the reader’s, and Lestrade’s, way, the case itself seems fairly obvious from the early stages. And obvious in a way that has been overused. Escape Rating C+: I wanted to like this a lot more than I did, especially after the promising start in the first book. Instead, the story feels a bit thin and stretched, as though the author has taken a good idea and pushed it past its limits. In order for this series to work, the characters need to change and grow. It makes no sense for Joanna to be such an exact replica of her father, particularly having grown up outside his influence. There should be some marked differences, and those differences would make her an interesting character in her own right. She also seems to face or have faced little of the difficulties that a woman in a man’s profession would have faced in the 1910s. Or she has completely brushed all of them aside. Even if she chooses to ignore those differences, anyone she deals with on a professional basis would not. And that constant fight should have had some influence on her character. There’s not enough there there, and I’m sorry to have to say that. I had high hopes for this series. But for a more believable female Holmes, I’m going back to Sherry Thomas’ Lady Sherlock series. 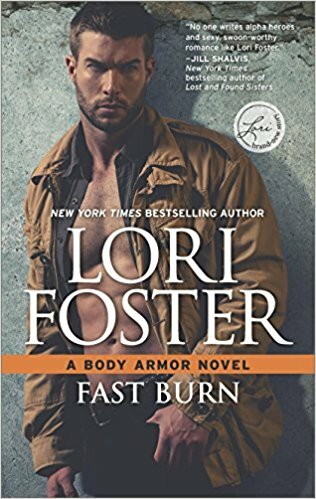 Fast Burn is the fourth and it looks like final book in the Body Armor series. I’ve had a mixed reaction to the books in this series. I loved books two and three, Hard Justice and Close Contact, but had a lukewarm reaction to the first book in the series, Under Pressure. This series is romantic suspense. That has meant that the bodyguards from the Body Armor Agency, former MMA fighters all, have a tendency to fall in love with the body they are guarding. But Fast Burn is a bit different, because the body that needs protection in this case is the owner of the agency, Sahara Silver. And the man who wants to guard her is not part of Body Armor. Not that she hasn’t tried to recruit Brand Berry, but that Brand has refused to be recruited, in spite of Sahara’s patented full-court press. Brand is interested in Sahara and not her Agency. He does not want to work for a woman that he wants to date. And a whole lot more. It makes sense to this reader. They can either have a personal relationship or a working one, but not both – especially not in their case, where both of them have the need to be in control of absolutely everything all the time. Compromise is not going to be easy for either of them. One of the underlying plot threads in this entire series revolves around Sahara’s missing brother Scott. Scott has been missing and presumed dead for a couple of years now, after his boat was found with his girlfriend’s dead body on it and plenty of his own spilled blood along with hers. But his body was never found, and Sahara believes that Scott is out there, still alive. When a bunch of thugs kidnap Sahara in order to get back the money that Scott owes them, one way or another, their leader believes that putting Sahara in danger will bring Scott out of the woodwork. He might be right, but before that can happen, it brings out the protective instincts of every one of the guys that Sahara has hired at Body Armor. As well as the one that she hasn’t, Brand Berry. Sahara is now the person with the target on her back, and Brand is more than willing to step up and protect her – 24/7. But not as a member of her staff. Not at all. He just wants to protect her, and wipe the floor with the guys who are after her. Sahara isn’t sure that she can give up being in charge 24/7 in order to let someone take care of her, even for a second. But the sharks are circling, and it’s a race to the finish. But whose? Escape Rating C+: One of the things that made the Body Armor series so good was the character of Sahara Silver. As the owner of the agency, she has been part of every single book, and generally a fairly large part. She’s been the person that many of the women in the stories initially turn to, and she’s been kind, understanding and helpful without either giving up any of her femininity or any of her take charge agency. Either the actual agency, Body Armor, or her own personal agency as a mover and shaker in each story. She loses all of that in Fast Burn. The whole story is all about all the guys, but particularly Brand, patting her on the head and letting her know that they’ve got this and that she really should let them take over and not worry her pretty little head. Whenever she tries to contradict or correct them, they pretty much ignore whatever she says. While the possibility of her missing brother not only being alive but protecting her from the sidelines is certainly enough to make anyone just a bit crazy, Sahara seems to go off the rails and fall apart, giving Brand the chance to swoop in and protect her – whether she needs it or not. As one of the characters says in one of my favorite video games, “swooping is bad”. The men, but particularly Brand, do their level best to keep Sahara from participating in an operation that is all hers – it’s both all about her brother and all about a gang of idiots that keep trying to kidnap her and even succeed more than once. She also runs off half-cocked and puts herself in danger in ways that are definitely outside her character until this book. This included an added filip of a trope I dislike, the one where the villain has a hard on for the female in danger and has the strong desire to take her and break her. This particular villain was much less vile than most, but that added element wasn’t necessary to ramp up the amount of danger Sahara kept landing herself in. At the same time, I really love the character of Sahara, and I wanted to see her get her HEA as well as solve the mystery of what happened to her brother. 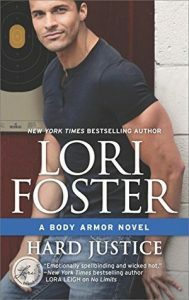 I’ve liked all of the men that she has recruited for Body Armor, and it was fun to catch up with them a bit and see just how much they all care about her boss. I just wish it hadn’t been necessary to take away so much of Sahara’s agency to protect her. I hope we see more characters like Sahara has been in the previous books, women who are intelligent, capable and very much in charge while still being happy and proud to be women. And we shouldn’t have to watch them sacrifice who they are to get their HEA. 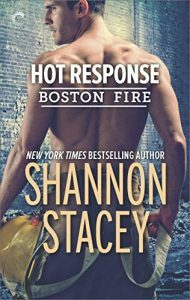 I plucked this out of the towering TBR pile because I’m reviewing the fourth book in this series, Hot Response, for a tour next month. While I don’t have time to read the middle books before my tour date, I did want to take the opportunity to see where it all began. The series features the firefighters in one particular Boston Fire company, as well as some of the regulars at the bar that most of them use as a second home. That the bar is owned by a retired member of their company probably has a lot to do with that. Lydia Kincaid has kind of run away from home, and from that home-away-from-home known as Kincaid’s Bar. Between the bar and the firehouse, it’s a very close-knit community, and Lydia was tired of everyone knowing her business – especially since that business includes a divorce from a firefighter. Not to mention that Tommy Kincaid, the owner of the bar, is her father. His expectation that both Lydia and her sister Ashley would work at his bar and nowhere else is just the beginning of his attitudes. He still seems pissed that Lydia divorced her lying, cheating ex-husband instead of giving him yet one more chance. Dear old dad is a bit locked into 1950s. But that tendency of the bar regulars to know and be up in the Kincaid’s business is currently more than her sister Ashley can handle. Ashley and her firefighter husband Danny are separated, and she can’t cope with every single bar patron commenting on her life and her choices. Sister to the rescue! Lydia comes home and takes Ashley’s place behind the bar, as well as her guest bedroom. It’s all supposed to be temporary, until Ashley and Danny either figure out how to fix what’s gone wrong, or figure out that it can’t be fixed. Then Lydia will run away again, as far from Boston as she can stand. Lydia’s plans are derailed when Aidan Hunt happens to them. She’s known Aidan forever – he’s her younger brother Scotty’s best friend. And he’s Scotty’s partner in the fire company, which means that he should be off limits to her. From the perspective of the story, it’s much more that she should be off limits to him. Both as his best friend’s sister and because any relationship drama will ruin the cohesiveness of a fire team that has to have each other’s backs every moment. But their chemistry can’t be denied. And instead of fighting it, they give in, both believing that the whole thing is only temporary, and that nothing good will happen if they tell either her brother or her father that they are seeing each other. Of course, they’re only half right. Escape Rating C+: I loved many of Shannon Stacey’s earlier books, including her Kowalskis series, and I really wanted to like Heat Response more than I did. Instead, I have a lot of mixed feelings. The overall feeling I got from this story is that it is a “bros before hos” story, to put it bluntly. Lydia and Aidan are both single and completely unencumbered. There is absolutely nothing wrong with the two of them getting together, whether it’s just a hookup, a friends with benefits relationship, or something more. But they both know that her brother Scotty and her father will be pissed that Aidan and Lydia are seeing each other, so they keep it secret. And, of course, when the lies are finally exposed it makes the situation exponentially worse. The problem for the story is that it feels as if all the tension created by their relationship and its secrecy is false. It feels unneccessary, especially as there are plenty of real sources of tension between Lydia and Aidan without adding a fake one. Lydia left Boston because she found the close-knit atmosphere of the firehouse and the bar stifling. Her relationship with her father is contentious at best, and her previous marriage to a firefighter was disastrous. Her ex was a lying, cheating jerk who used his uniform and his job to find more opportunities to cheat and more ways to hide his cheating from Lydia. Her dad seems to have put his job and his brotherhood ahead of his family. Lydia is tired of playing second-fiddle to a fire company, and has no desire to get into any kind of relationship with any more firefighters than she already is between her dad, her brother, and her currently estranged brother-in-law. Her vow to stay away from relationships with firefighters along with her frequently stated plan to leave Boston as soon as Ashley is back on her feet, provide enough reasons for Aidan to be wary of a relationship with her, because she’s clear from the beginning that she’s not planning to stick around. That means that there were plenty of problems to provide conflict for their relationship without adding the lying and the eventual fighting between Aidan and Scotty. Or at least that’s my take on it. I found the secondary romance between Ashley and Danny to be much more interesting, and wish we’d seen a lot more of it. They’re separated, not because either of them did anything wrong, but because Danny suppresses all of his emotional reactions. Ashley feels lonely all the time, because Danny just isn’t emotionally present. It is a big and very, very real problem, and it takes them most of the book to finally start talking with one another. I loved seeing them start working things out, and I wish I’d seen more of their story.